One must manifest discipline of spirit; without it one cannot become free. Nicholas Roerich [Николай Константинович Рёрих] (9 October 1874 – 13 December 1947), also known as Nikolai Konstantinovich Rerikh, was a Russian archeologist, painter, poet, mystic, spiritual teacher and social activist. 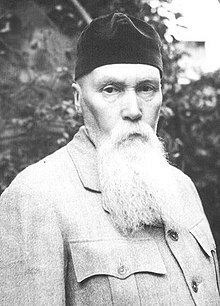 He and his wife Helena Roerich were co-founders of the Agni Yoga Society, and began the Pax Cultura initiative, which resulted in an international treaty known as the Roerich Pact. I am not astonished that we receive so many enthusiastic responses to our Peace Banner. Where all the treasures of mankind must be saved, there one should find such a symbol that can open the inmost recesses of all hearts. The evolution of the New Era rests on the cornerstone of Knowledge and Beauty. I am not astonished that we receive so many enthusiastic responses to our Peace Banner. The past is filled with deplorable, sad and irreparable destructions. We see that not only in times of war but also during other errors, creations of human genius are destroyed. At the same time the elite of humanity understand that no evolution is possible without the cumulations of Culture. We understand how indescribably difficult are the ways of Culture. Hence the more carefully must we guard the paths which lead to it. It is our duty to create for the young generation traditions of Culture; where there is Culture, there is Peace; there is achievement; there is the right solution for the difficult social problems. Culture is the accumulation of highest Bliss, highest Beauty, highest Knowledge. I was asked to collect information where the symbols of our Banner of Peace could be found. It turned out that the symbol of the Holy Trinity has been scattered all over the world. This has been explained in various ways. Some say it means the past, present and future, bound by the ring of eternity. Others find it more palatable to explain it as religion, knowledge and art in the ring of Culture. Obviously there were various explanations already in the ancient times, but the symbol, the sign itself had become fixed all over the world. … You can find it on the ancient icon in Bar depicting St.Nicholas. The same is on the centuries-old image of St.Sergius. It is on the image of Holy Trinity. It is on the coat of arms of Samarkand. It is on ancient Ethiopian and Coptic antiquities. It is on Mongolian rocks. It is on Tibetan rings. The steed of happiness on the Himalayan Mountains passes bears the same flaming sign. It is on all the brooches of Lahuli, Ladakhi and Himalayan Mountains. It is on Buddhist banners. Going back to the Neolithic depths we can find the same sign in the ornaments decorating their pottery. … And that is why the symbol was chose for all uniting Banner as the symbol that has passed through centuries, more exactly — millennia. The symbol was not a mere decorating ornament all over, it bore a very special meaning. Collecting all its images together, we might prove that it is the most extensively spread and ancient one among all the symbols of mankind. No one can claim that it belongs but to one religion or is based on the only one folk-lore. It would be very beneficial to glance at the evolution of human consciousness in its variegated forms. Where all the treasures of mankind must be saved, there one should find such a symbol that can open the inmost recesses of all hearts. The symbol of the Banner of Peace has been spread so surprisingly far and wide that people are quite sincerely asking whether it is original or an invention of later times. We have witnessed honest wonderment after having proved its ancient origins and spread. At present mankind is beginning to think with horror like troglodytes again, hoping to safeguard their property in underground depositories and caves. But the Banner of Peace just announces the principle. It argues that mankind has to find a way to agree, that its achievements are global and belong to all the nations. The Banner says: noli me tangere — do not touch — do not dare to disturb, to offend the Universal Treasure with a touch of destruction. The abode of the Teacher not only cannot be made known but cannot even be uttered. Your question shows how far you are from the understanding of the Teaching. Even humanly you must realize how wrong your question is. Cease speaking of enemies when an achievement can kindle a great light. He who has envisioned evolution will approach it carefully, joyously brushing away the dust on the path. Most important, there will be no fear in him. And rejecting the unnecessary he will acquire simplicity. It is easy to understand that the realization of evolution is always beautiful. Again they will ask: "Why at the beginning of the path is so much that is pleasant accorded and so much forgiven?" It is because in the beginning all fires are full blown and the called one walks as a torch. It is up to him to choose the quality of his fire. He who comprehends the discipline of spirit will understand the direction of the fire and will approach the cooperation for the General Good. The end of the path can be illumined by athousand fires of the General Good. These thousand fires will light the rainbow of the aura. Therefore, the discipline of spirit is wings! We are dissipating superstition, ignorance and fear. We are forging courage, will and knowledge. Every striving toward enlightenment is welcome. Every prejudice, caused by ignorance, is exposed. The Great Helpers of humanity do not abandon the Earth so long as sufferings go unhealed. Humanity must suffer very much before it comes to an understanding of the advantage of unity. Wayfarer, friend, let us travel together. Night is near, wild beasts are about, and our campfire may go out. But if we agree to share the night watch, we can conserve our forces. Tomorrow our path will be long and we may become exhausted. Let us walk together. We shall have joy and festivity. I shall sing for you the song your mother, wife and sister sang. You will relate for me your father's story about a hero and his achievements. Let our path be one. Be careful not to step upon a scorpion, and warn me about any vipers. Remember, we must arrive at a certain mountain village. Thou who dost toil, are not alive in thy consciousness the roots of cooperation and community? If this flame has already illumined thy brain, adopt the signs of the Teaching of Our mountains. Thou who dost labor, do not become wearied puzzling over certain expressions. Every line is the highest measure of simplicity. Greeting to workers and seekers! No name will provoke so many attacks as that of Maitreya. Family, clan, country, union of nations — each unit strives toward peace, toward betterment of life. Each unit of cooperation and communal life needs perfecting. No one can fix the limits of evolution. By this line of reasoning a worker becomes a creator. Let us not be frightened by the problems of creativeness. Let us find for science unencumbered paths. Thus, thought about perfectionment will be a sign of joy. The essence of striving to the far-off worlds is contained in the assimilation of a consciousness of our life in them. The possibility of life on them becomes for our consciousness, as it were, a channel of approach. Indeed, this consciousness must be dug through as a channel. People are able to swim, yet a considerable portion of them do not swim. Such an obvious fact as the far-off worlds completely fails to attract humanity. It is time to cast this seed into the human brain. The Great Helpers of humanity do not abandon the Earth so long as sufferings go unhealed. Wholehearted fellowship can easily heal the wounds of a friend — but it is necessary to develop the art of thinking in the name of Good. And this is not easy amid the day's hustle and bustle. But the examples of the Great Helpers of humanity can encourage and infuse new forces. Humanity must suffer very much before it comes to an understanding of the advantage of unity. Most destructive forces have been directed for the purpose of obscuring the embryos of unification. Each unifying agent is subject to personal danger. Each peace-maker is disparaged. Each worker is ridiculed. Each builder is called madman. Thus the servants of dissolution try to drive from the face of the Earth the Banner of Enlightenment. Work is impossible amid enmities. Construction is inconceivable amid explosions of hatred. Fellowship is battling with man-hatred. Let us keep in memory these old Covenants. When calculations become complex and Infinity is obscured, then will be remembered anew the simplest principle: from heart to heart — such is the law of fraternity, community, fellowship. does thy consciousness quiver or expand? when before thee looms Infinity? They will ask, "Can the time of Maitreya create a New Era?" Answer, "If the Crusades brought a new age, then truly the Era of Maitreya is a thousandfold more significant." In such consciousness should one proceed. Now, at the dawn of the age of Maitreya, there is needed a Yoga comprising the essence of the whole of life, all-embracing, evading nought. One remembers the example of those unignitable youths in the biblical legend who valiantly sacrificed themselves to the fiery furnace and thereby acquired power. You may call this the Yoga of Life. But the most precise name will be Agni Yoga. It is precisely the element of fire that gives its name to this Yoga of self-sacrifice. No name will provoke so many attacks as that of Maitreya, for it is bound up with the future. Nothing provokes so much fear and irritation in people as thinking about the future. Understand once again that the time of changes of continents is approaching. Maitreya is coming, in the vanguard of science, addressing its new frontiers. All the problems of science and of the evolution of all that exists are of concern to the Teacher. He started a kind of pact between nations for the preservation of these cultural and artistic monuments. Many nations agreed to it. I do not know exactly what the value of their agreement was because we agree to many things which we forget in times of war and trouble. We have seen recently in the late war the destruction of so many great monuments of culture in spite of all the previous agreement to protect them. Nevertheless, the fact remains that it is a tragedy for destruction to overtake these great cultural monuments of the past. I have keenly followed your most remarkable achievements in the realm of Arts and also your great humanitarian work for the welfare of nations of which your Peace Pact idea with a special Banner for the protection of cultural treasure is a singularly effective symbol. This page was last edited on 18 October 2018, at 19:38.